2015 has been the first full year in operation for Acceleratio. Acceleratio helps companies, cities and governments to make a transition towards green growth. We believe you have the potential to make your business model or municipality sustainable. True to our name we help you to accelerate to your vision. 2015 ended with a bright spark. In December the world signed a Climate Agreement and 195 nations, more than 400 companies, 120 investors and 150 cities contributed with serious commitments. As Unilever’s CEO Paul Polman said: this might be the greatest business opportunity of the century. For Acceleratio it was the crown on a year with a lot of activities in our key area’s of focus: Waste Management, Circular Economy and Smart & Sustainable Cities. How did Acceleratio fare in this year? A first step towards a more circular economy is waste management. Acceleratio chaired the Waste and Recycling Conference for the 4-th time and brings in a lecturer on sustainable waste management in the Waste & Resource Management Training. Acceleratio helped to kick start an action programme of Belgium waste management companies towards fair public-private competition in their market. An initiative from Acceleratio, launched on March 3 in London, on a Circular Economy Seminar organised by the Dutch Embassy and the Green Alliance, by Dutch MP Stientje van Veldhoven, called the “North Sea Resources Roundabout” took a lot of momentum in 2015 and might lead to the first “International Green deal”. The aim of the Green Deal is to encourage further recycling in the EU and industry uptake of secondary resources, identify (perceived) barriers due to differences between national regulation or to international regulation or administrative burdens, finding solutions to the identified barriers and thus create legal certainty and a LPF as a basis for more investments for industry. The North Sea Resource Roundabout will focus on solving cross border barriers from concrete cases involving secondary resource flows and share the learning experience from these cases with a larger group of stakeholders. A Green Deal on the North Sea Resources Roundabout can serve as a demonstration area for the EU as a whole. At the World Resources Forum in Davos Acceleratio gave a presentation in the workshop “Moving towards a Circular Economy by bridging top down and bottom-up approaches”. Acceleratio supported NederlandCirculair! A much appreciated report, an inventory of barriers and drivers towards a Circular Economy, was made for the Dutch Ministry of Environment. The results have been taken over in various digital platforms and many presentations were given a.o. several Ministries, NederlandCirculair! the public waste management branch NVRD and the network for environmental professionals VVM. In the beginning of 2015 the first national Circular Economy Conference took place with almost 200 participants. It was initiative from and moderated by Acceleratio that will have a follow-up in 2016. One of the focus area’s of the programma NederlandCirculair! Is to increase the involvement of the new generation and start-up’s with Circular economy. Together with Het Groene Brein, the Dutch Centres for Entrepreneurship and SMO Acceleratio initiated and supports a Circular Economy booster programme for start-ups called the CE Booster. The programme will be extended in 2016 to support the full life cycle of start-ups. Acceleratio was part of the jury of the Accenture Innovation Awards for the Circular Economy theme. On the theme of Circular Economy and the Financial Sector Freek van Eijk (Acceleratio) wrote the chapter “a new sustainable economy is circular” in the book “The profitable benefits of sustainability”. Acceleratio is already working on a 2016 Conference in London on the theme. Acceleratio was furthermore quoted in an Milieumagazine article titled ”Circular Design as motor of the transition”. In a city everything comes together: people life, work and recreate in a city. It is the place of action for top-down and especially bottom-up initiatives and it touches upon themes like building, mobility, food, smart data, public space and environment. During the year several Circular Economy workshops have been organized for Municipalities. Together with Euroforum and Pluraal, Acceleratio initiated and set up the first integral Smart a Sustainable City Training. Acceleratio is one of the lead lectures of this programme that will be continued in 2016. Acceleratio has been twice to Brazil as a trade mission leader for SME’s on a governmental programme on the themes of Urban Health, Sustainable Cities and Circular Economy. The Netherlands are a sustainable Urban Delta. The experience the Dutch built up can be inspirational and the technology and approach can give a boost to finding solutions for Brazils rapid urbanization. At the SIMAI conference is Sao Paolo Acceleratio was one of the key note speakers and presented “the Historic Perspective and Best Practices of Smart and Sustainable Dutch Solutions. 2016 will be the year that the world will have to start working out the ambitions and pledges from the Climate Conference in Paris. It is the year that the Dutch will chair the European Union and will lead the discussions on the EU Circular Economy Act (Closing the Loop). As an individual we can give the example with for example what we buy, how we consume and how we separate our waste. It is about the “Power of One” and “do more with less” in our families and within our companies. Acceleratio wishes you all a healthy and sustainable 2016 and would love to give a boost to your sustainable ambitions in 2016. Do not hesitate to contact us! 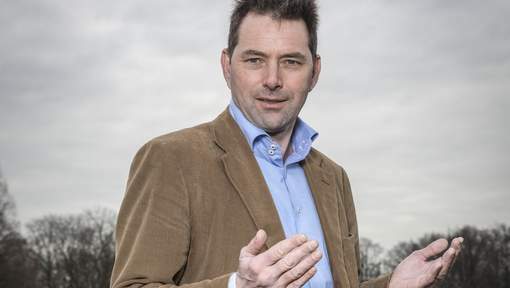 Picture: Freek van Eijk: ‘Business as usual is geen optie meer.’ © Dingena Mol.